It's Very true Do not judge anyone by the way they live, talk and look! ! Because that could be you someday!! i wish people could walk in my shoes. 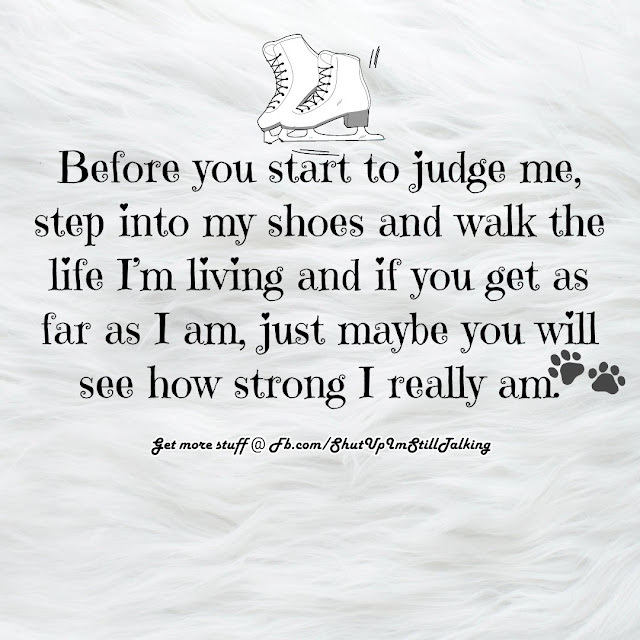 Those who judge should look to their own lives. Judge your self first we all the same in God eyes ameen..!! Take a wonder in my shoes, go on make my day. I KNOW YOU COULD NOT HAVE DONE ALL WHAT I HAVE DONE AND BEEN WHERE MY LIFE ROAD TOOK ME AND STILL CARRY ON. I wish people could walk in my shoes picture/image is an Inspirational Stuff to Inspire and Motivate You. You can download pics by just clicking on the Images. Thanks for visiting Truth Follower an online place for huge collection of inspiring pictures, quotation, and Sayings Images. If you like I wish people could walk in my shoes, Please Share with friends and family on Facebook, Twitter, and Pinterest.